Wow! Two weeks later , here we are with another post. In our defense, we covered a lot of miles and found some great new places. 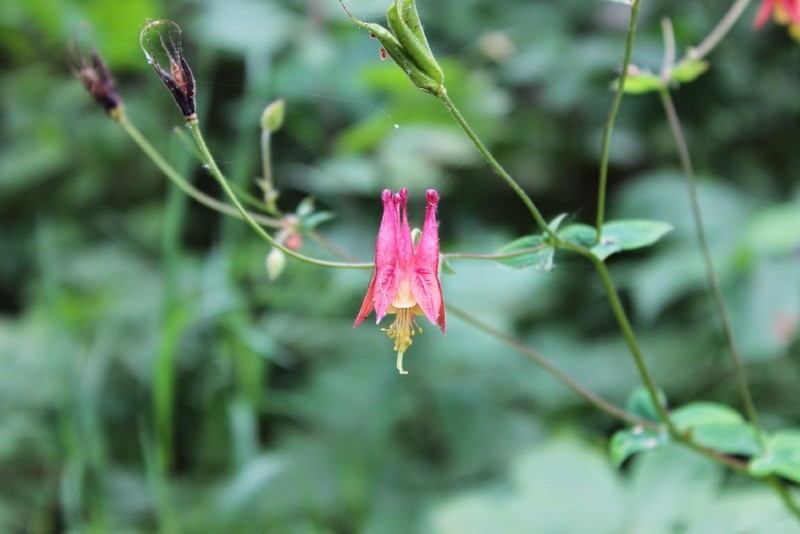 Leaving the Upper Peninsula of Michigan, it is nice to find wild flowers that we are not used to seeing. 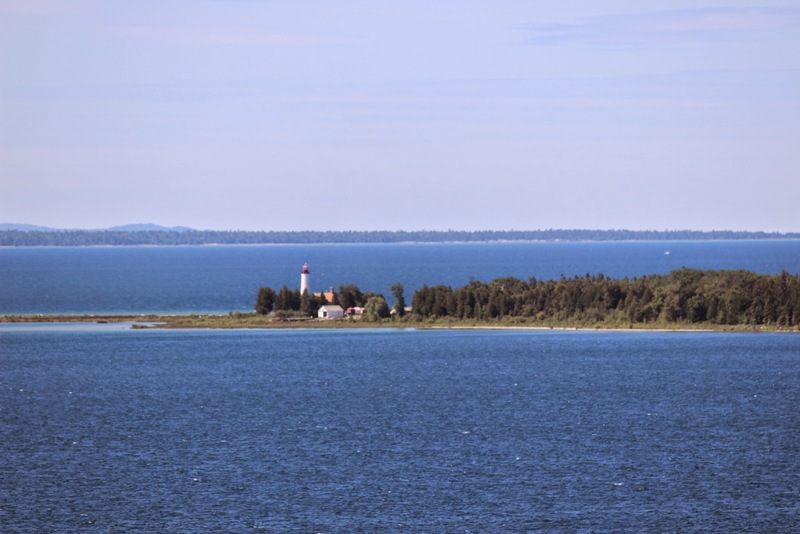 Leaving Brevoort Lake, it is a short drive to the Mackinac Bridge that connects the UP to the LP of Michigan. A few nice rest areas along the way offer great views of Lake Michigan including this lighthouse. Before long, there are views of the bridge. We were lucky to have a great, clear day. Jan and I are always reminding ourselves to stop and take in the many flowers that we see along the way. 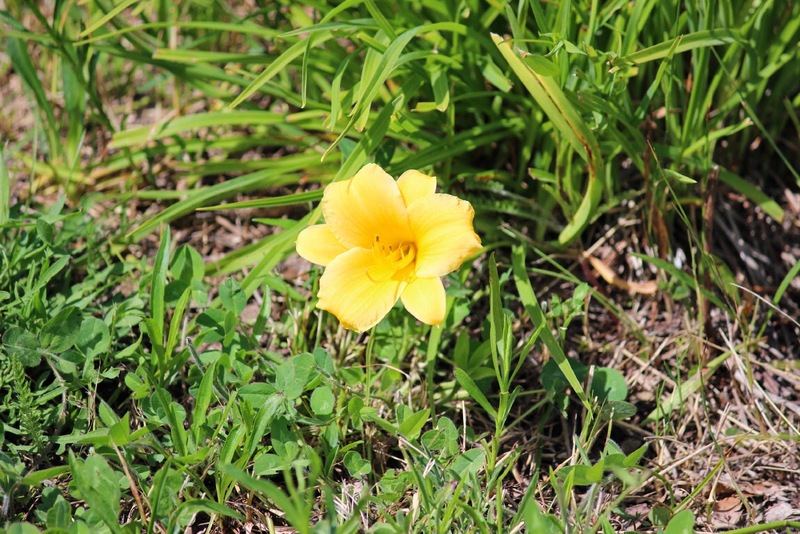 Spring blooms seem like yesterday---so let's enjoy summer!! 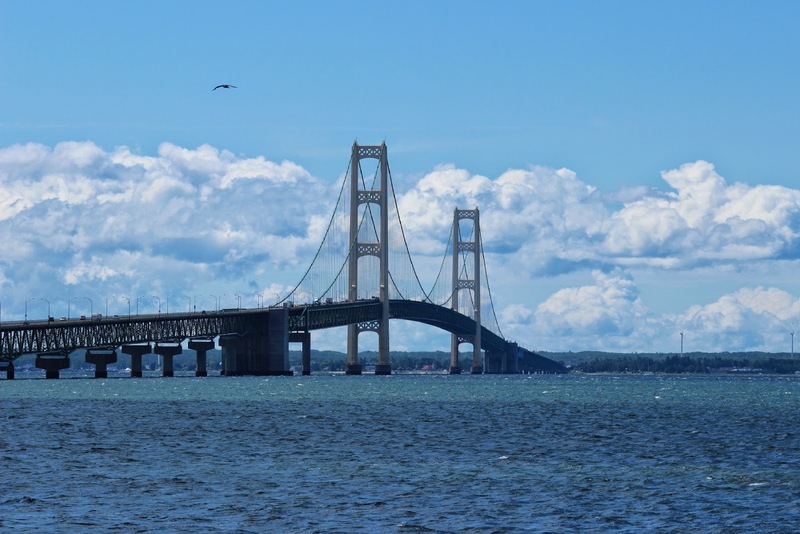 We know that some of you saw a picture last year of the Mackinac Bridge, but we are always looking for better shots. We thought this one came out very well. Note a lot of traffic on the bridge, or at least more than we expected. Jan and I had headed down the east coast of the Lower Peninsula last year. That was quite enjoyable, quiet and picturesque along the shores of Lake Huron. This time we head down the west coast along the shores of Lake Michigan. Very different and enjoyable in different ways. More upscale homes and towns on this side. 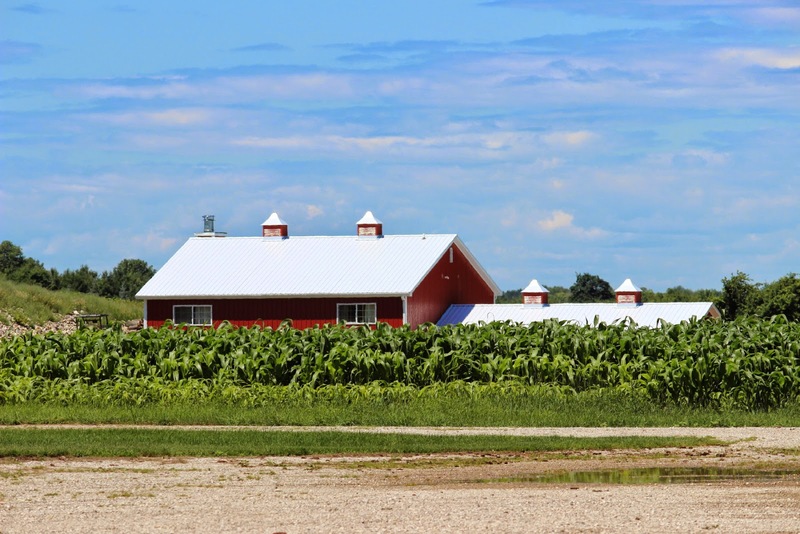 Also many farms and farmstands. 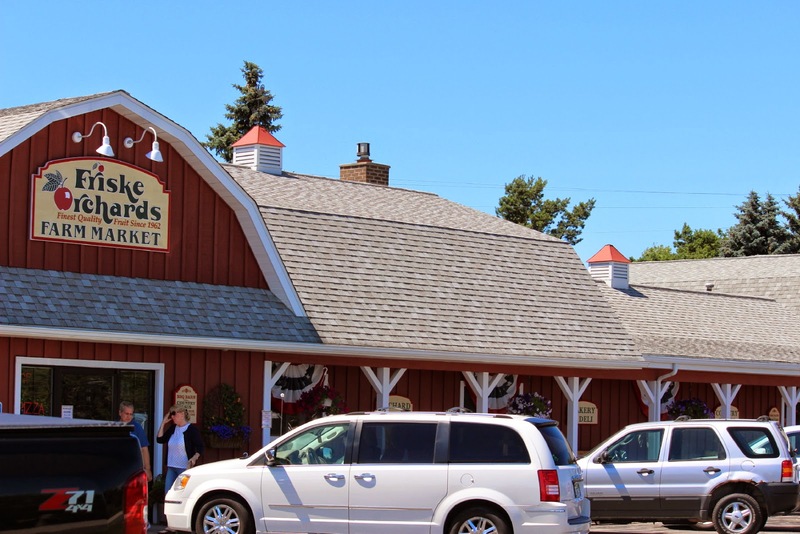 This is one is called Friske Orchards. 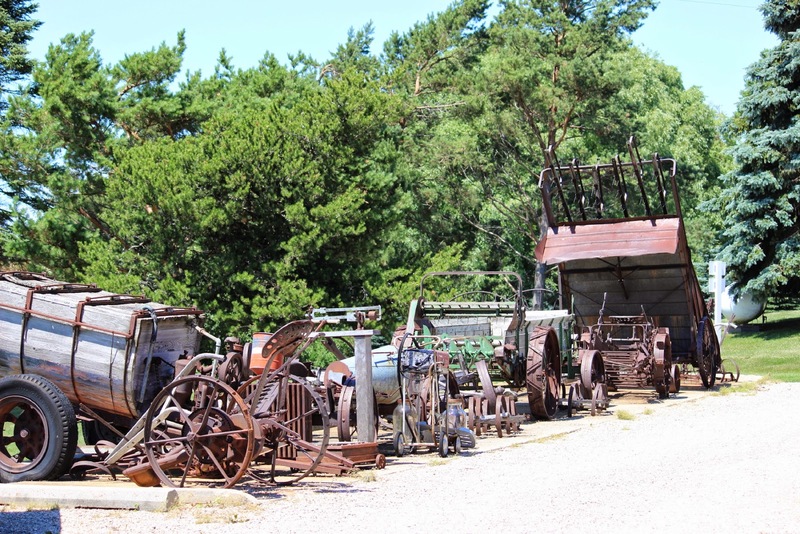 A collection of antique farm machinery is in the back. The market is quite busy. There is a gift section, fresh fruit section, and , of course, a bakery. 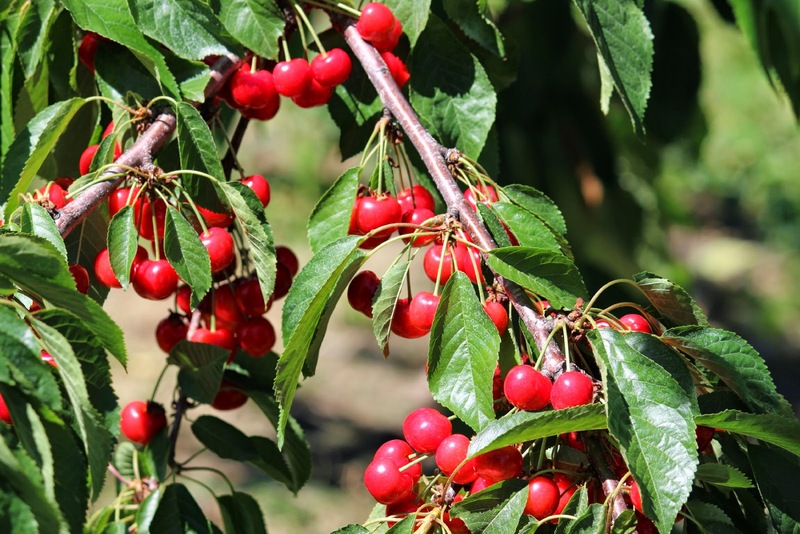 The fruit that we see along the highways are cherry trees. Evidently , there are many more varieties than the Bing Cherries that we see in the grocery stores. 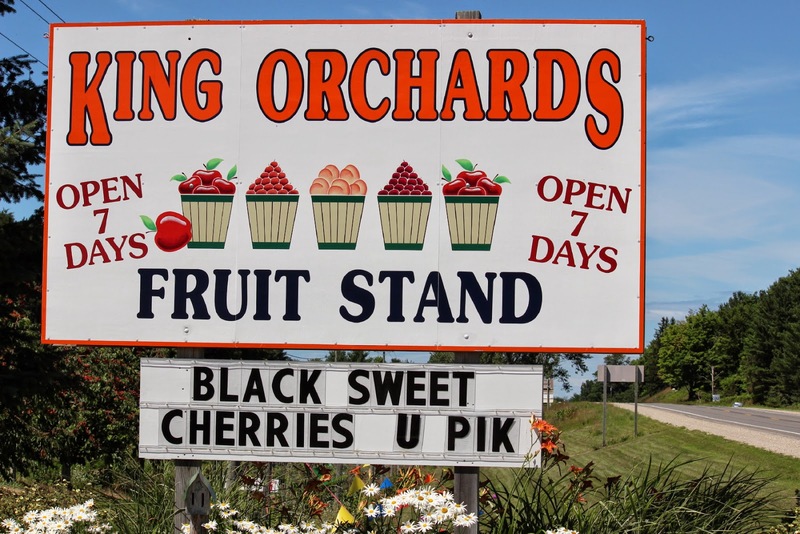 Both of these fruit stands are located in the Ellsworth, Kewadin area. 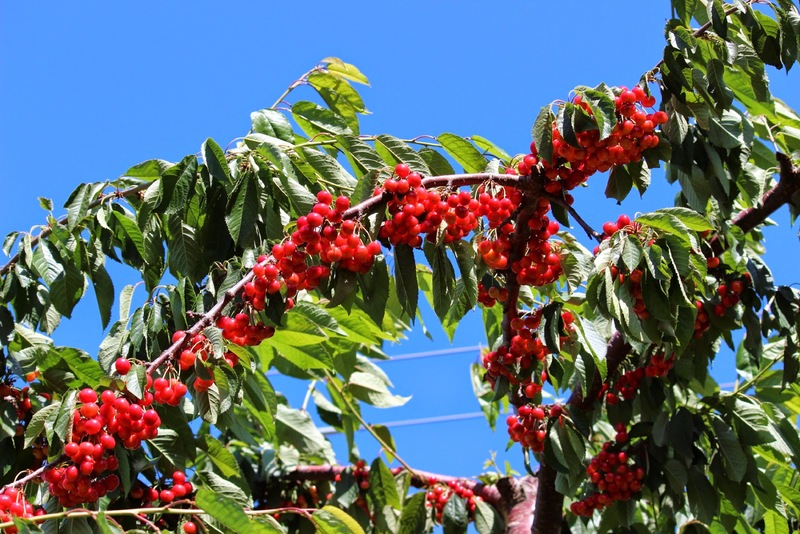 The black sweet cherries are super sweet--picked ripe from the trees. Also here, we picked up the best cherry pie ever!!! Oh yes, there was also fresh corn. 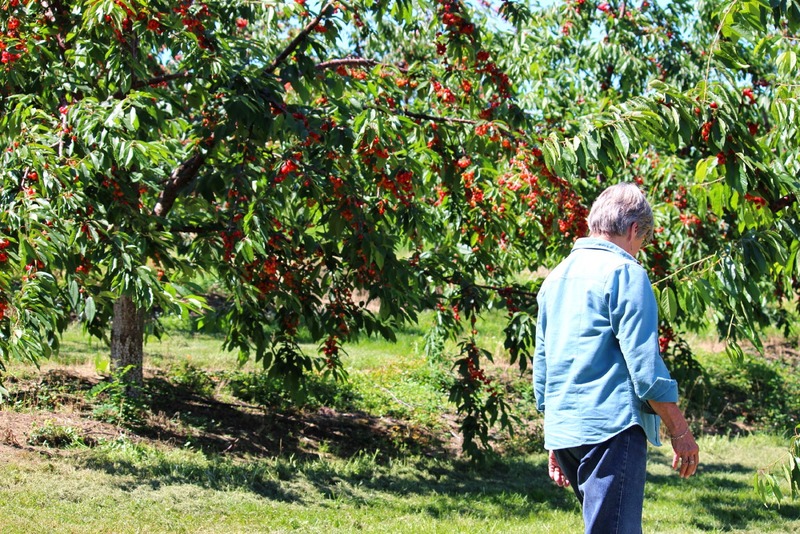 Going by the orchards we think maybe the trees have gone by, and then we realize that what we are seeing are trees loaded with ripe cherries. These are a lighter color than the Bing. I think they were also not as sweet. Looks like picking should be easy??? After our fruit stand stops , we head for Traverse City State Park, right across the street from the beach on Lake Michigan. A very popular park, but a little too busy for our tastes. 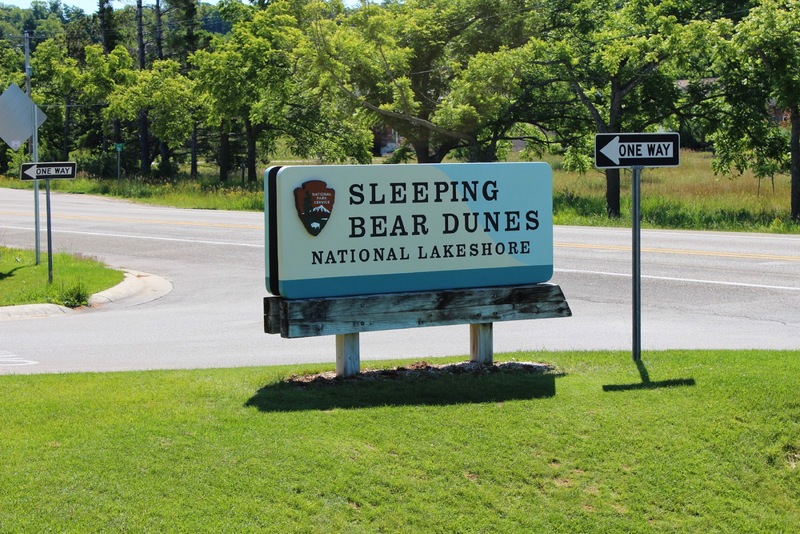 Then we find Sleeping Bear Dunes National Lakeshore. Much more our style. Jan and I find a nice campsite in D.H. Day campground. A national park with the senior pass made it $6 per night and a great site---one of the last few available. By the way, anyone camping here should keep in mind that there is a LOT of poison ivy in and around the sites. 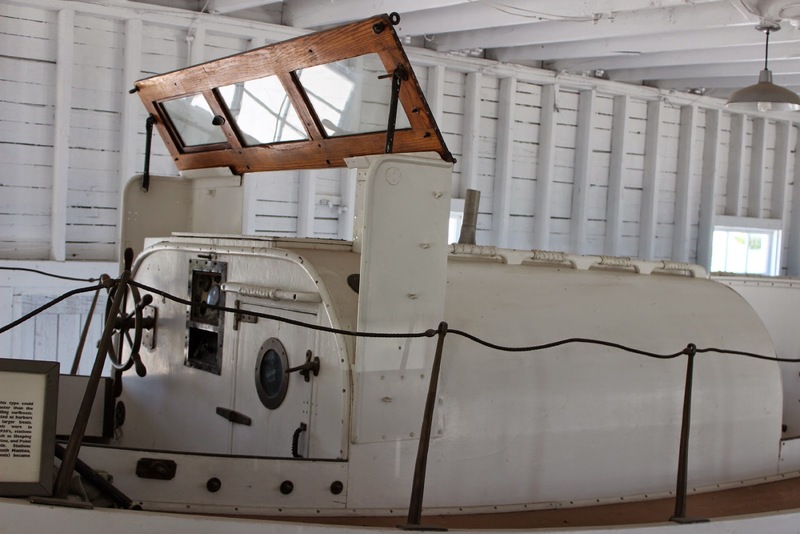 This was a Coast Guard unsinkable vessel that ended the need for the U.S. Lifesaving Service on the Great Lakes. 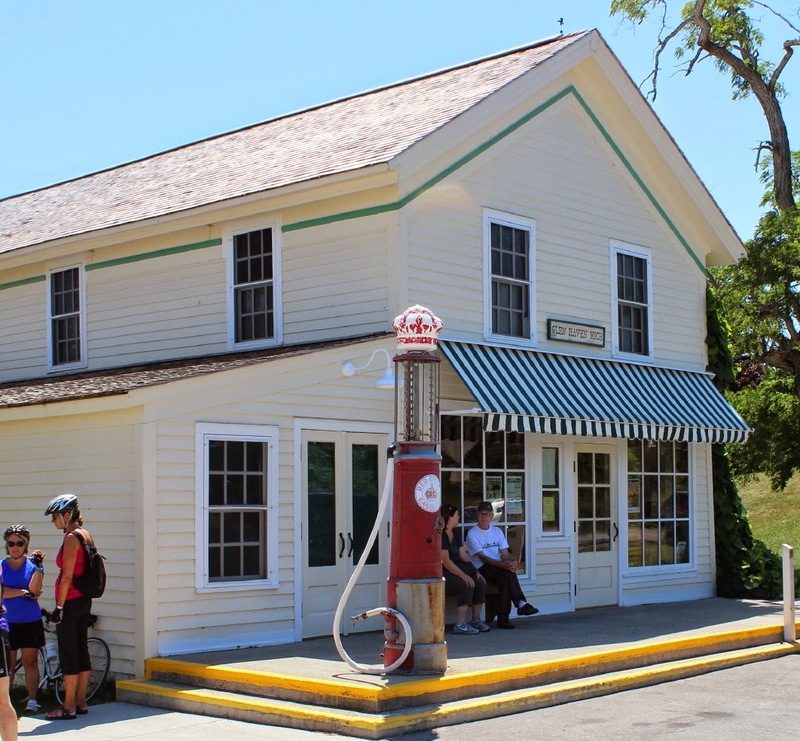 Another nice thing about D.H.Day is that there is a wonderful bike trail , the Sleeping Bear Heritage Trail that takes you to the old Glen Haven village, and the marine museum. This is the general store as it was back in the early 20th century. Inside the store are all kinds of pictures and reminders of life here in years past. 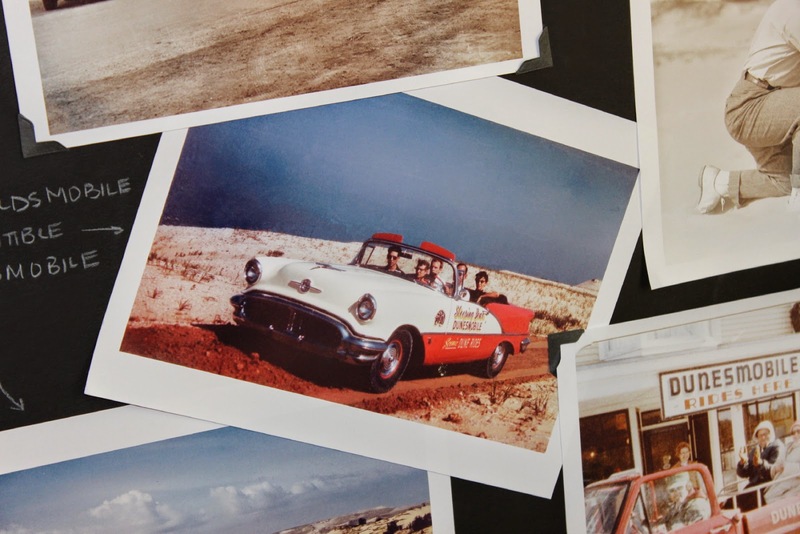 We thought Cliff might like this picture of a group riding along the beach in a 1956 Oldsmobile convertible. Although, I thought Cliff's convertible was a 1957? The counter is still set up like it would have been many years ago. In the background is an old organizer that would keep the slips for each customer. The pigeonholes were for different goods. 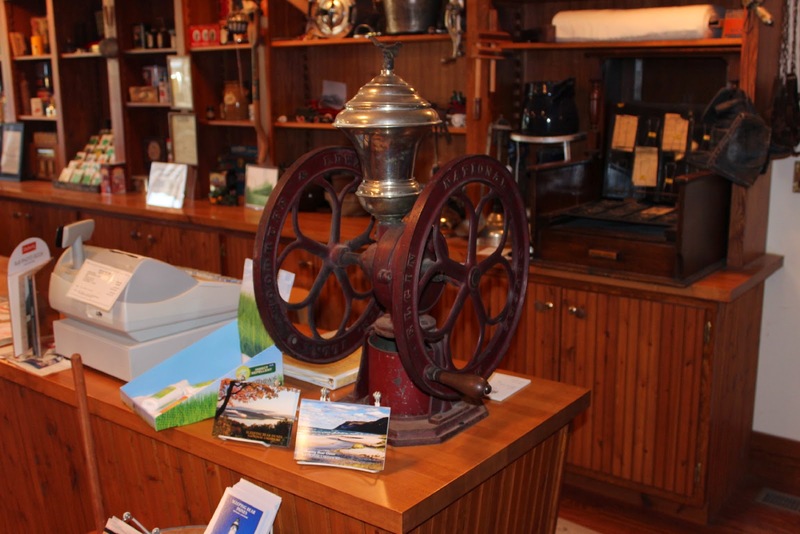 And--you guessed it--- on the counter was the general store sized coffee grinder. 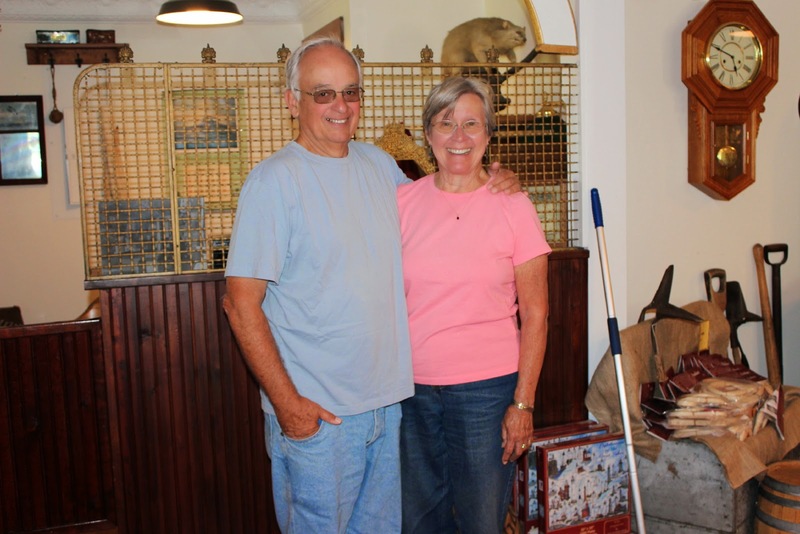 The docent agreed that it was a good idea to take a picture of the old folks next to all the old stuff. At least we're still smiling. Lady Blue was happy to have a few days rest in her nice spot. Our bike ride from the campground took us to the beach and the the famous dunes. 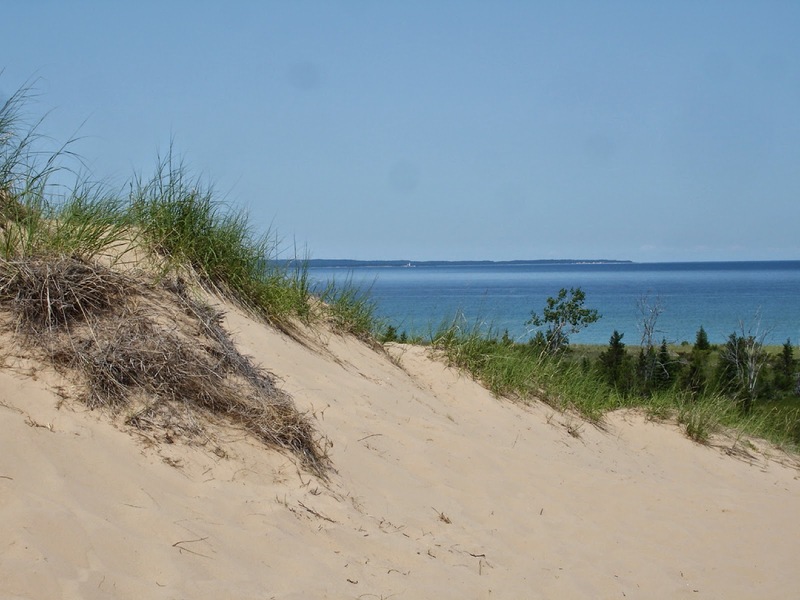 Yes, these dunes are very much like Cape Cod dunes and the sand is very similar. The only real difference is that the water is a lot warmer and no surfing. 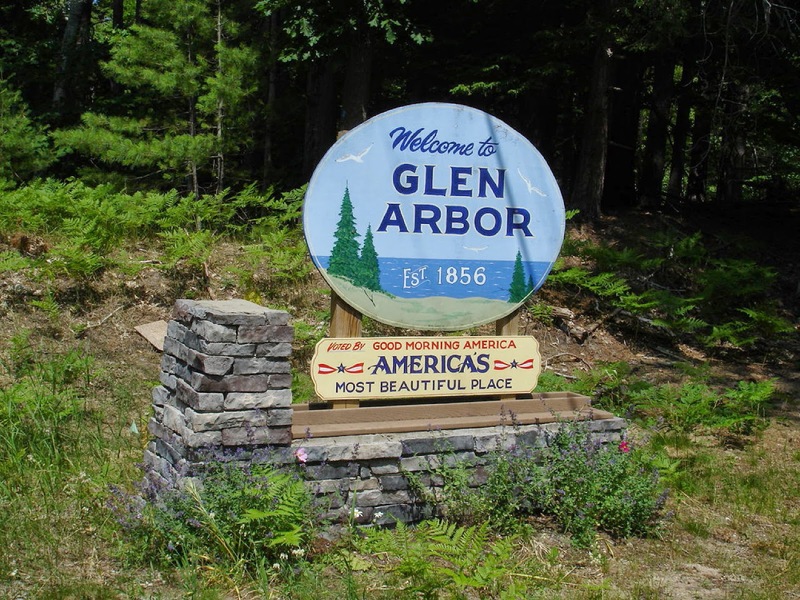 Besides the old Glen Haven village, there is Glen Arbor which is a modern vacation community. 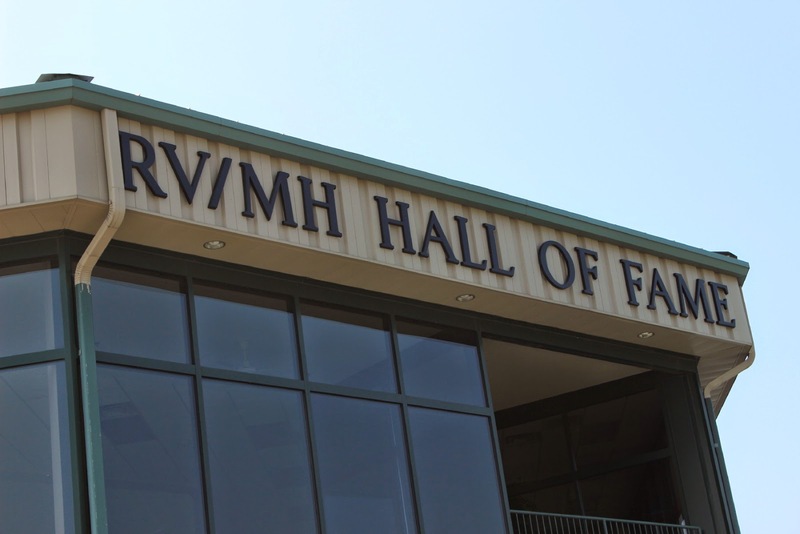 Note the accolade at the bottom of the sign. Always on the lookout for old vehicles. This seems to be still running. 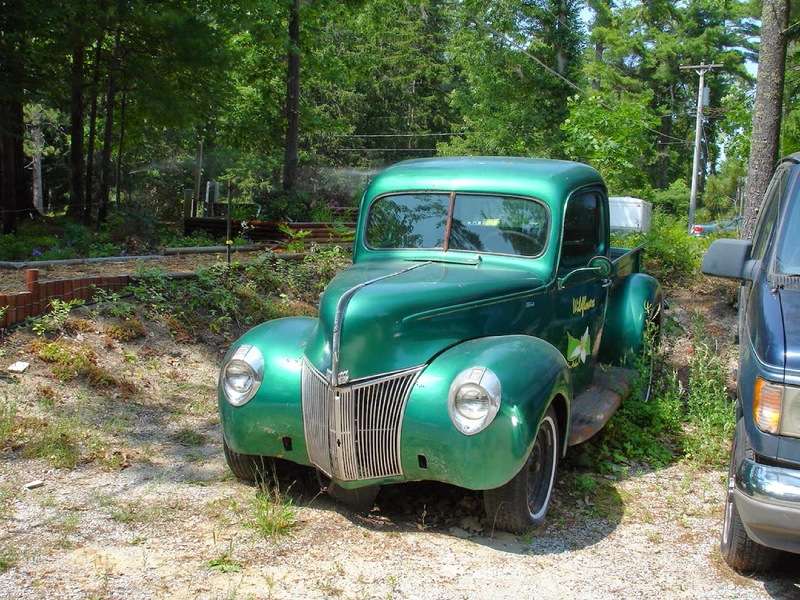 We believe it is a 1940 Ford truck. 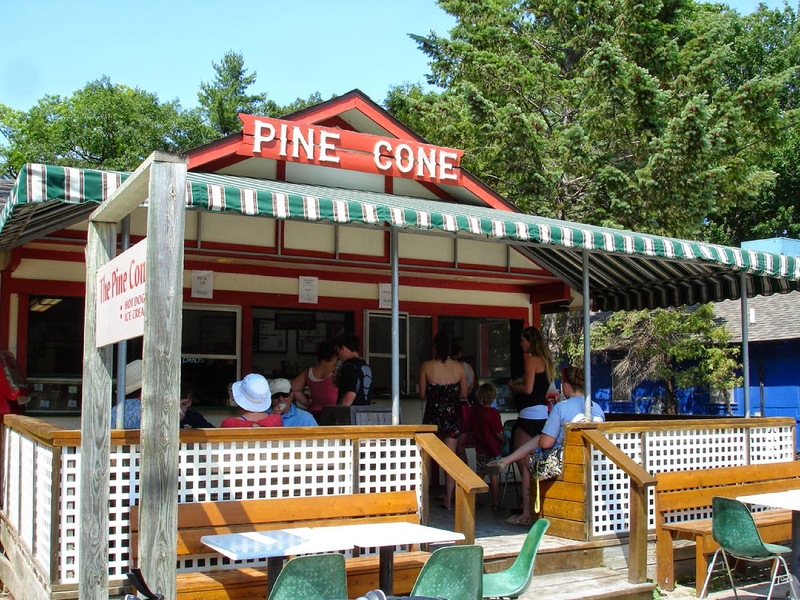 A local had recommended the Pine Cone for an ice cream cone. She was so right!! One good flavor was Tipping Cow. Lady Blue was so good on these roads. 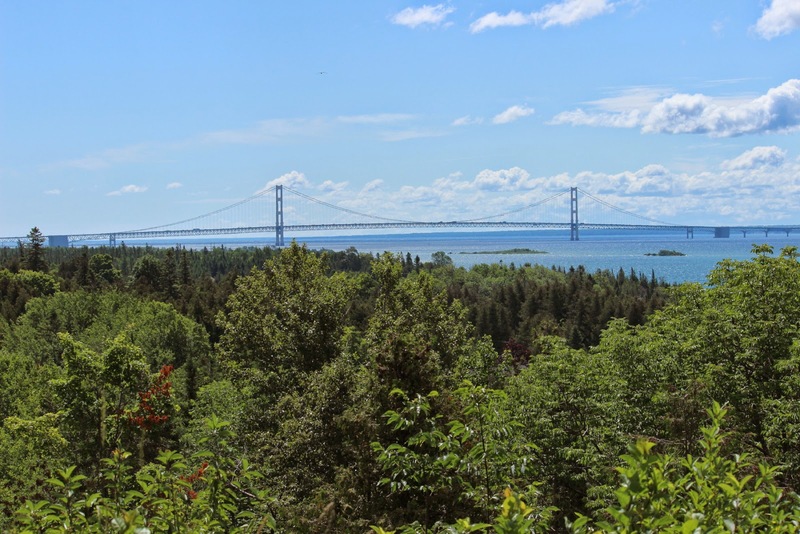 One road just south of Mackinac Bridge was called the Tunnel of Trees. Of course we tried it while looking for views of Lake Michigan. A very colorful road which at times was only one lane wide. We did a lot of hugging the sides along the 25 mile stretch. 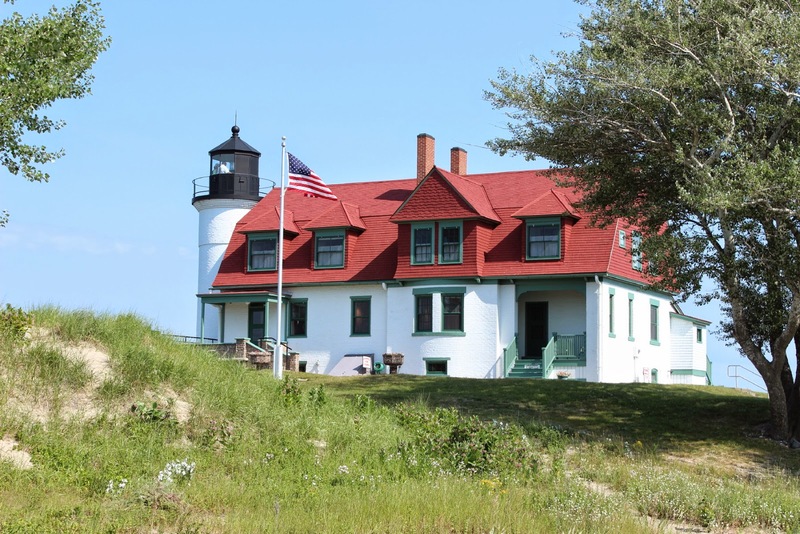 This side trip was to view Point Betsie lighthouse. From the west coast of Michigan, we head to Indiana. 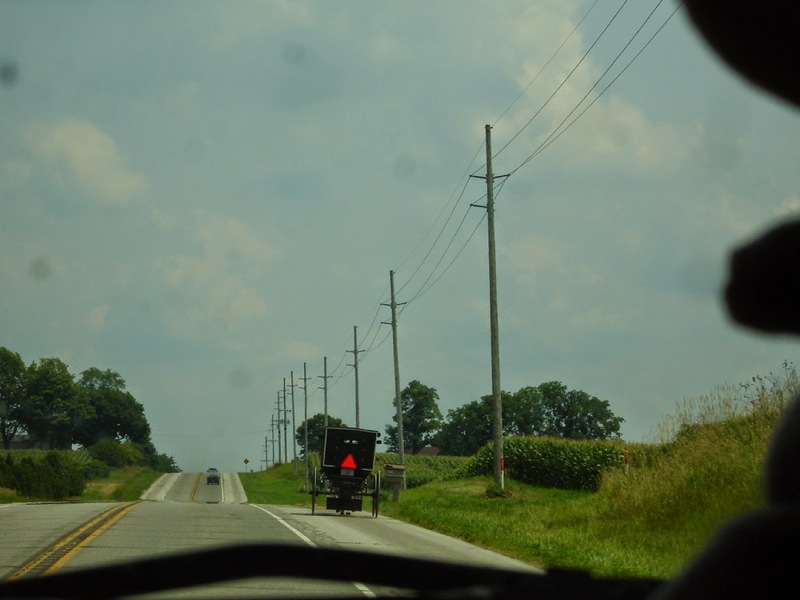 Along the way are reminders that much of this area is also Amish country. The state of Indiana and into Ohio. We have read a lot about this place in the magazines. Some of the articles were wondering if it could survive after the economic crash. We are here to say that it did! 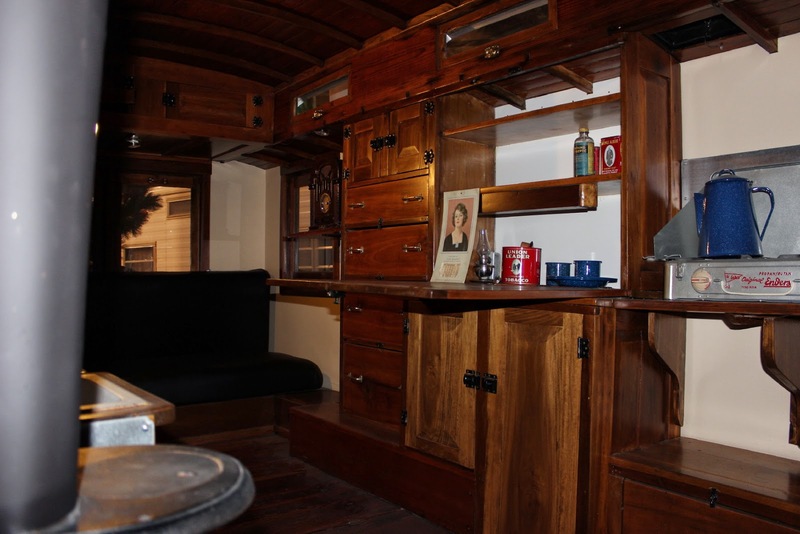 This is a 1916 Telescoping Apartment, selling for $100. The sides and the end would telescope back into the body for travel. This side of the unit looks like a bureau. Jan and I look at these and wonder where they would camp in 1916? They were lucky if they could find roads that would be passable. A view from above with the 1916 Telescoping on the right. It also produced warm water for the shower using the heat from the radiator. We thought some of you would enjoy this one as well. It is a 1931 Model AA Ford Housecar. The floors are yellow pine and the cabinetry and interior is oak and poplar. Note the curved roof and the stove on the left..
Couldn't bypass this one. This is a 1968 Jayco Jayhawk Camper. Remind you of anything? How about Gail and Richard's tent camper? 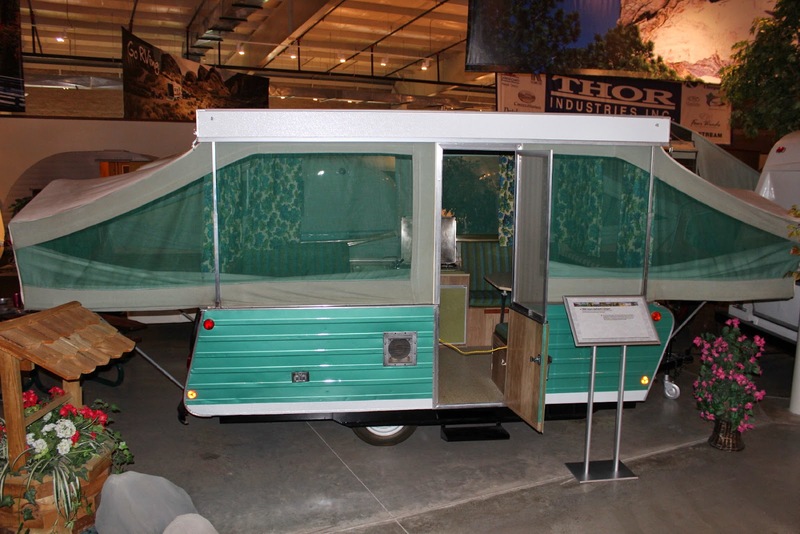 This was the 40th trailer produced by Lloyd Bontrager at the start of Jayco production. 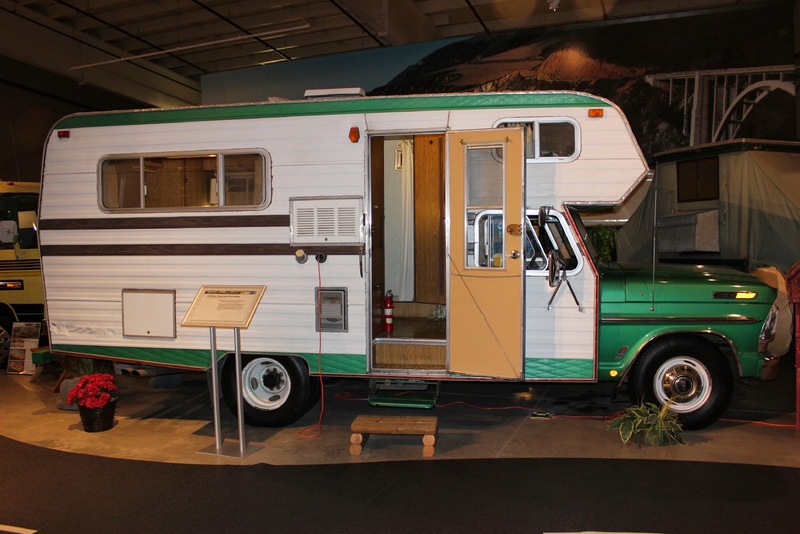 There were many interesting units, including a number of Airstreams and an early Winnebago motorhome. This is a 1969 Stites Truck Camper. One of the first to be mounted directly to the chassis( not a slide in). 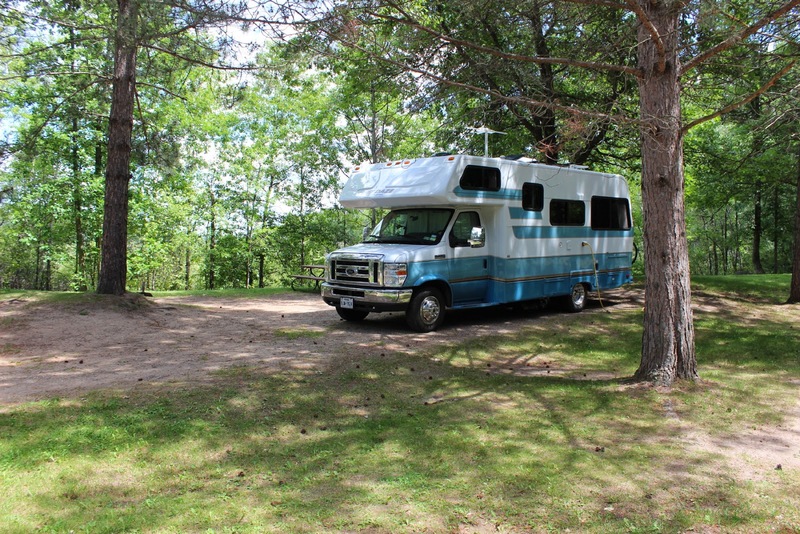 It is a precursor of Class C motorhomes, or in other words , Lady Blue. Looking through the older RVs, we are surprised how long it took to include tanks, bathrooms, and running water. 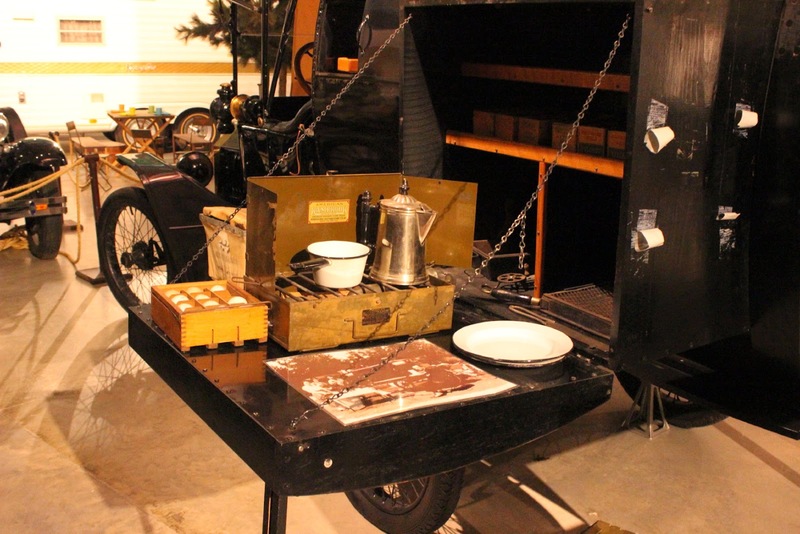 But then, we were impressed by the inclusion of ice boxes, camping stoves, and heater stoves in the older models. 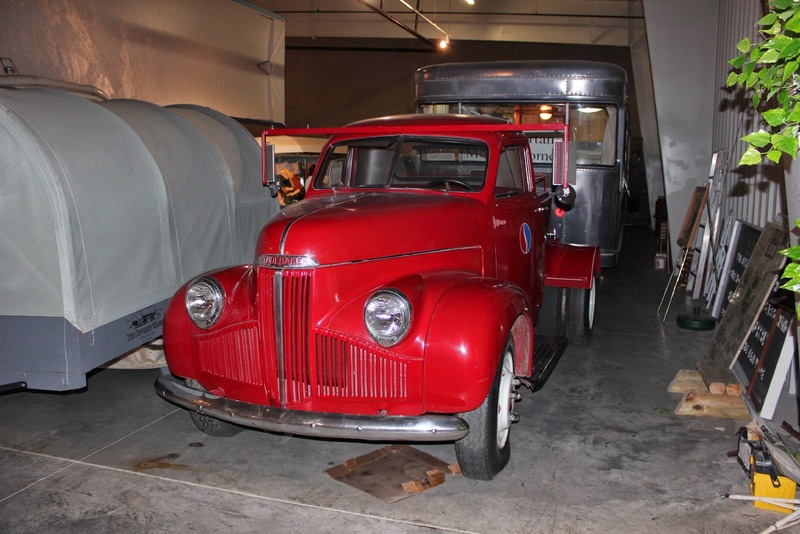 By the way, this is a 1946 one ton Studebaker truck that was quite popular for many things, including hauling this early aluminum trailer. 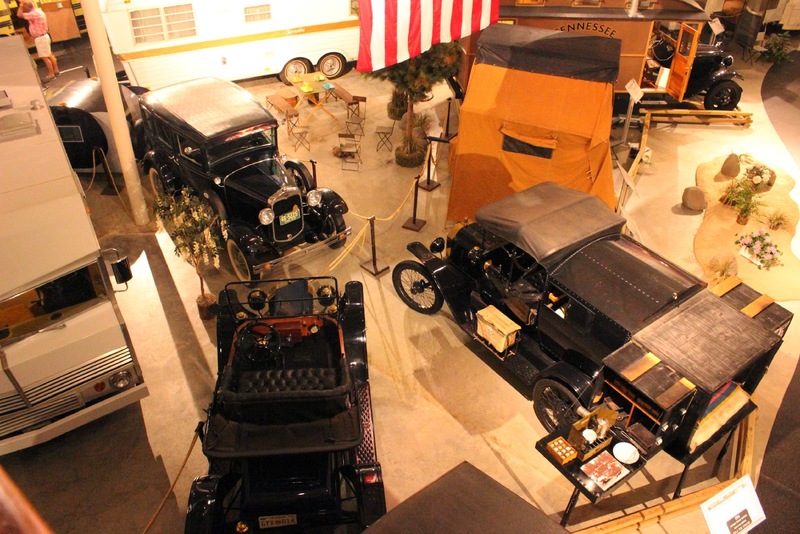 Elkhart, Indiana is known as the RV capital of the world. It is also known as the Band Instrument capital of the world making Conn instruments among others. We tried for back roads, staying off the interstate where possible. 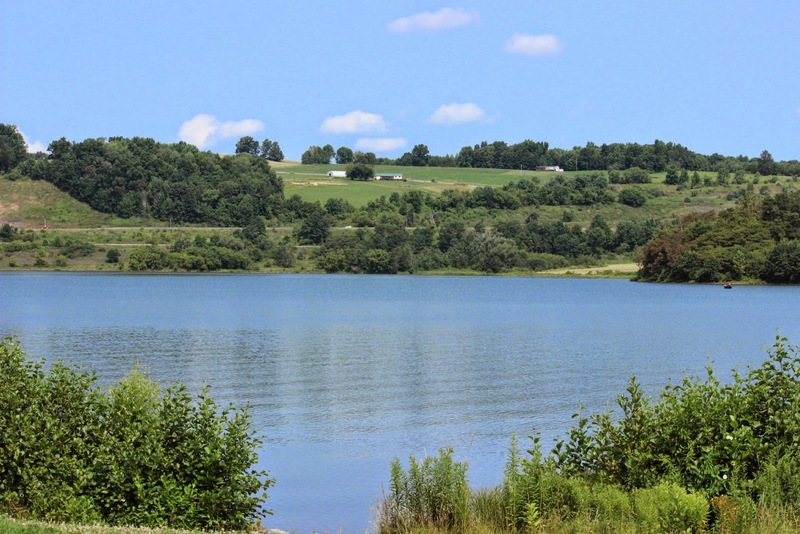 This was one of our Ohio stops at Harrison Lake State park in Fayette, Ohio. 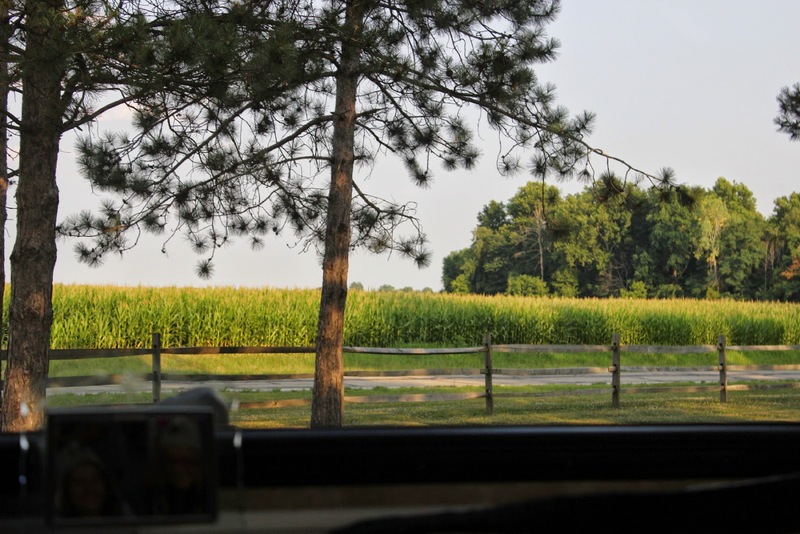 A plus is the view of the cornfields out our back window. Another plus was $12 with our Passport America discount. Unfortunately, this is only at certain state parks in Ohio. Our stay at Geneva State Park did not include a discount, but it was on the shore of Lake Erie. Still avoiding major highways, our route follows Route 6 into western Pennsylvania. 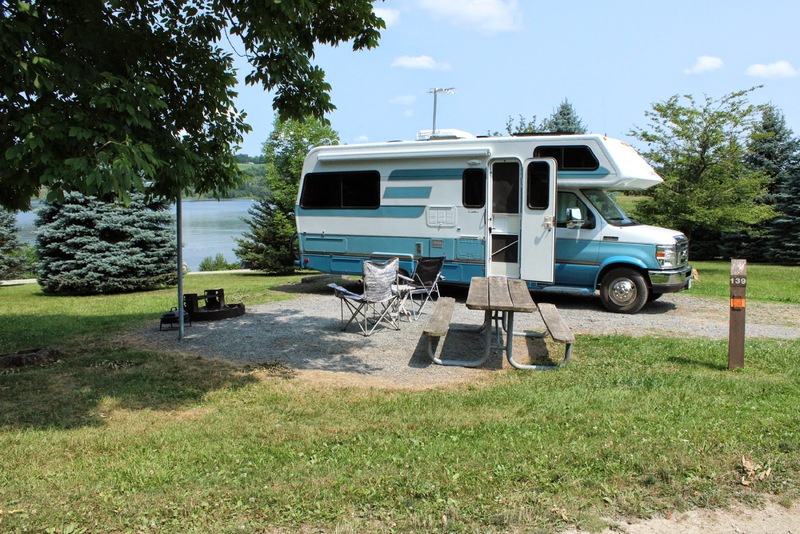 One of our favorite quiet spots is Red Bridge Campground in the Allegheny National Forest. No hookups, no phone signal, no TV, and no weather radio. But still a great campground and also discounted for the America the Beautiful pass. Then , on to Ives Run Corps of Engineer campground in Tioga, Pennsylvania just outside Wellsboro. 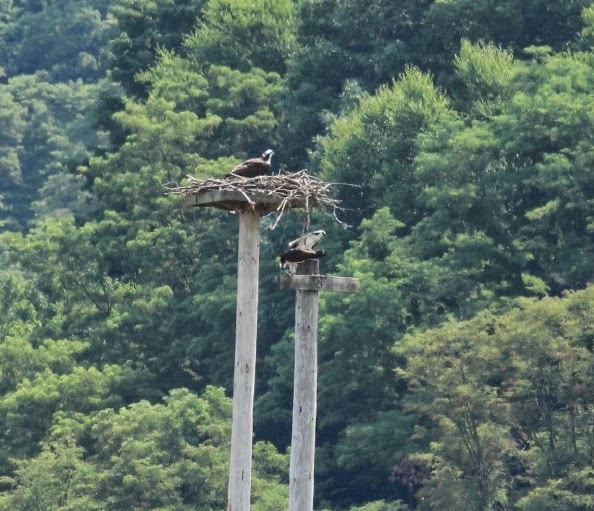 These are some osprey in the park. The campground is quite busy and on a Thursday, we find that there are only about three sites open. Luckily, they are in the dry camping section that we prefer. As you can see, we have a great site with a view of Hammond Lake. All this for $10 per night. We also have a chance for more bike riding and hiking while unwinding from some extra mileage. One more stop in Pennsylvania and then New England, here we come!! 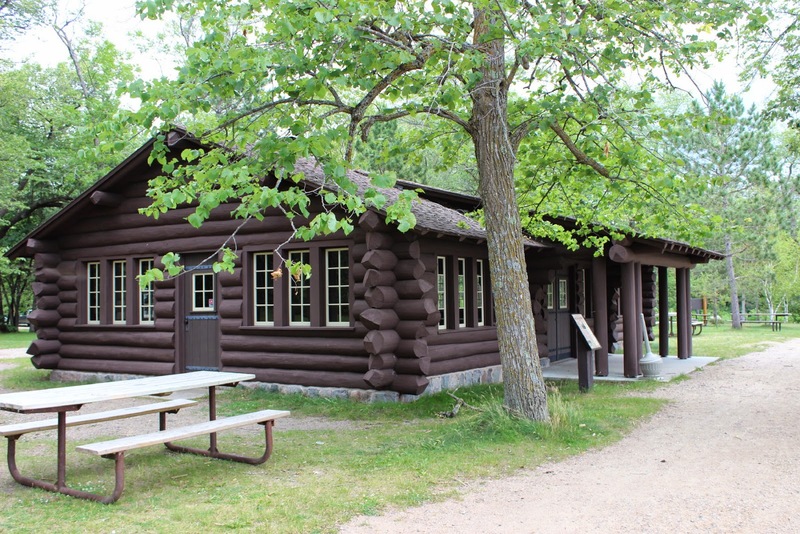 Lake Bemidji State Park, MN to Two Lakes NF Campground, WI. Some stops just appear along the way. And-----you have to stop. This is one. In the small town of Rugby, North Dakota. Not much notice , but a sign will tell you that this monument is here along the side of Route 2. 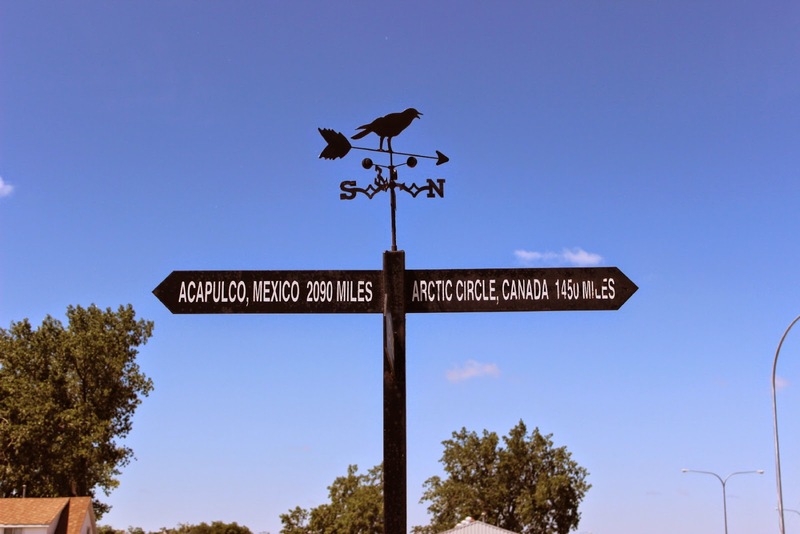 The geographical center of North America. Notice it was not the center of the U.S., but the center of North America. This one we can relate to. 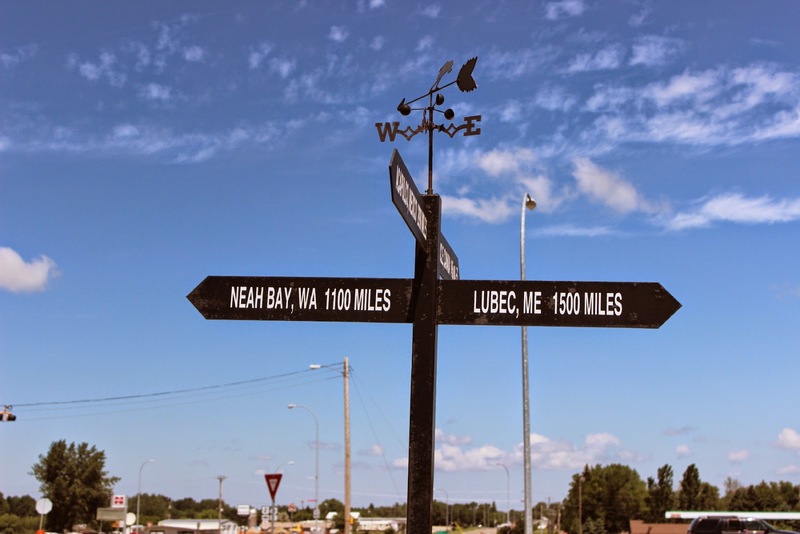 Lubec, Maine is the most eastern point of the U.S. 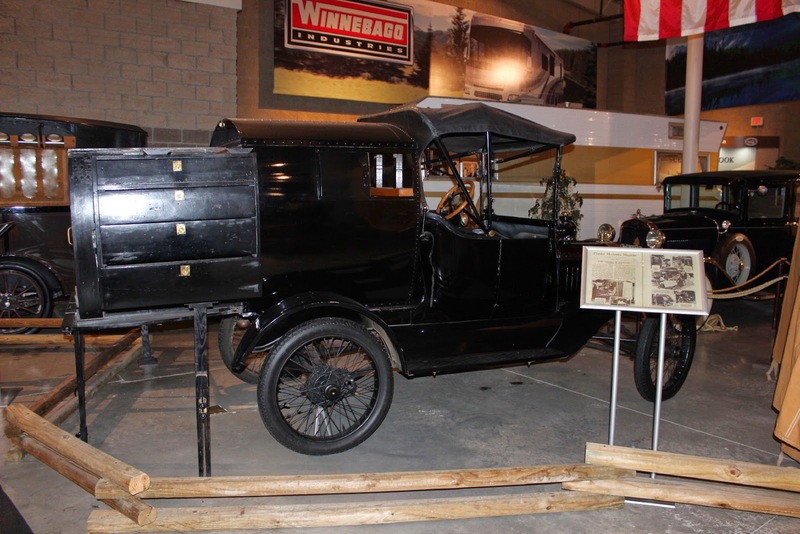 Even in Minnesota, the many public works started in the 1930's are evident. This building is very similar to the CCC buildings in Arkansas and other states. In terms of nature , we would have to say that the mosquito is the most obvious form to be found. In fact, maybe Wayne, who sometimes looks at this blog and lives here, could tell us if they really do have schools where they train the mosquitoes to attack. Much nicer to look at the wild flowers. 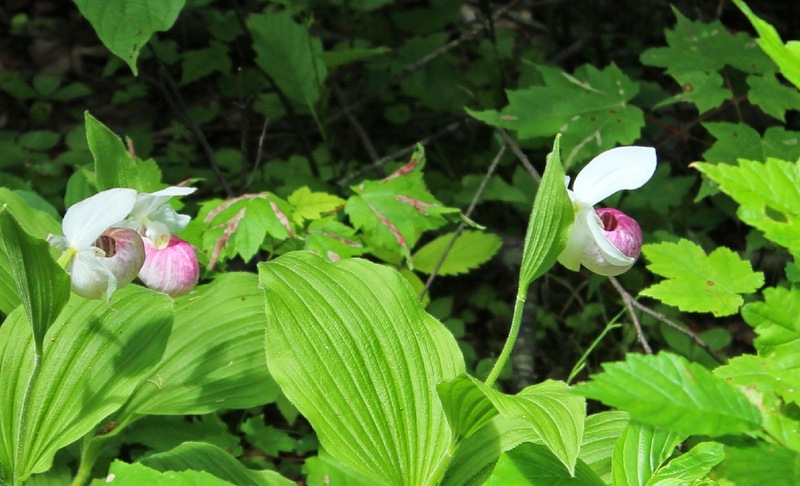 These ladyslippers are the state flower for Minnesota. 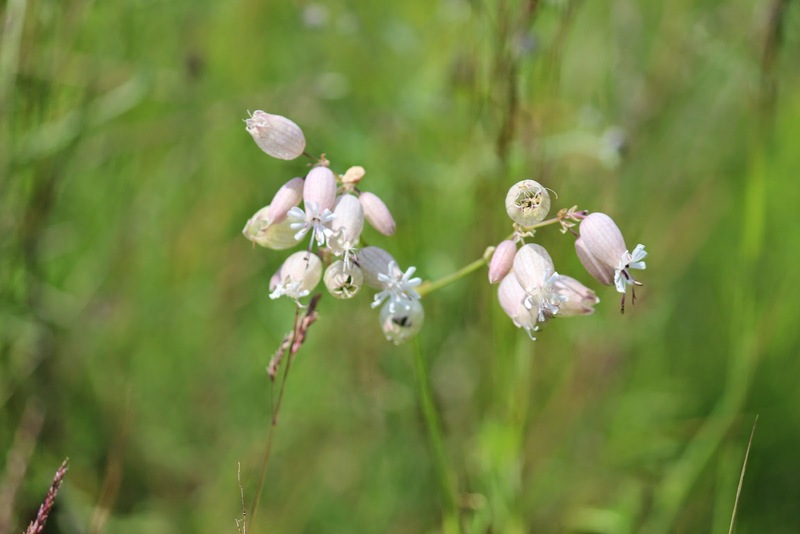 They list them as wild orchids. These were just finishing their bloom around July 7th. On Cape Cod, the ladyslippers bloom around Memorial Day. 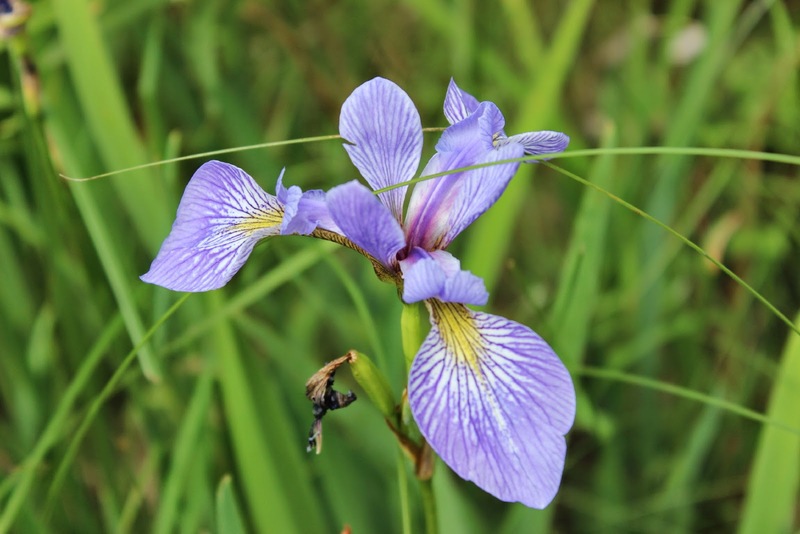 Even wild irises can be found. 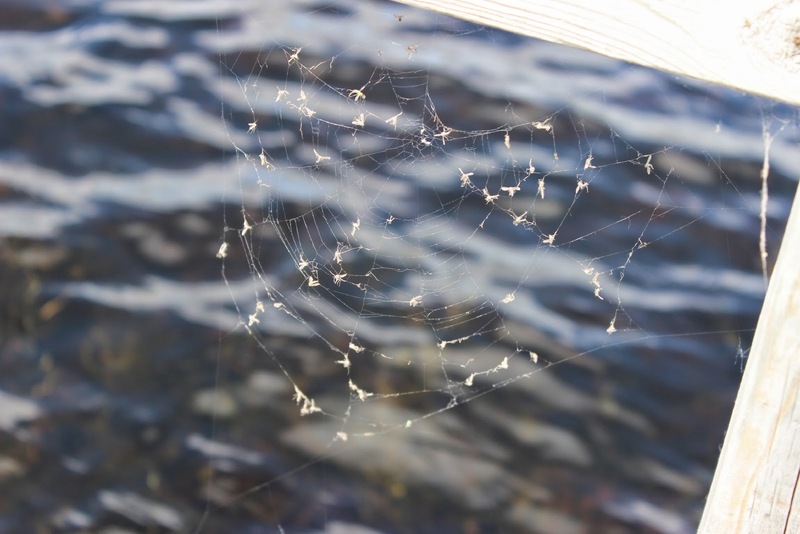 Jan and I saw many of these spider webs around the ponds. It took a while , but a closer look will tell you that the spiders are enjoying the mosquitoes. 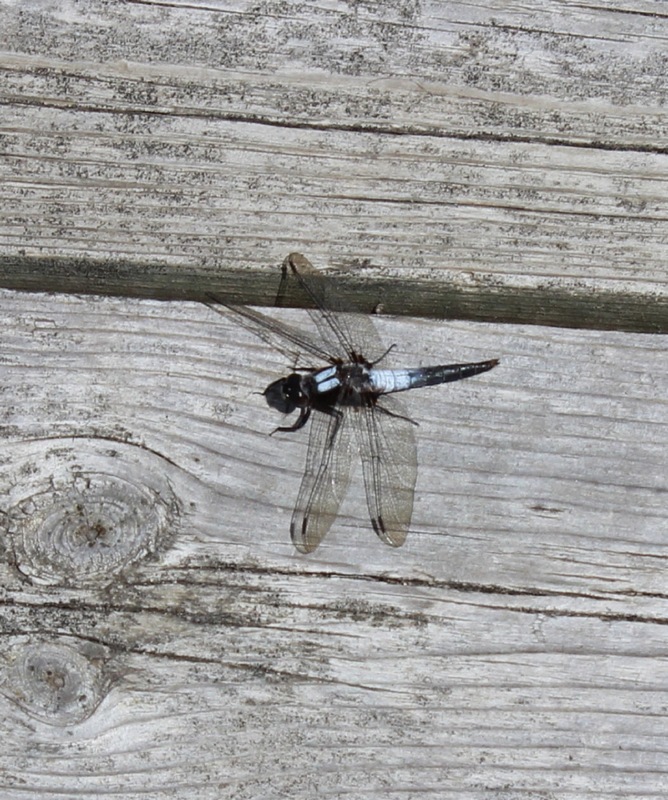 The ponds are also home to a number of different kinds of dragonflies. The large state parks have a constant need to keep track of trees that might be hazardous. 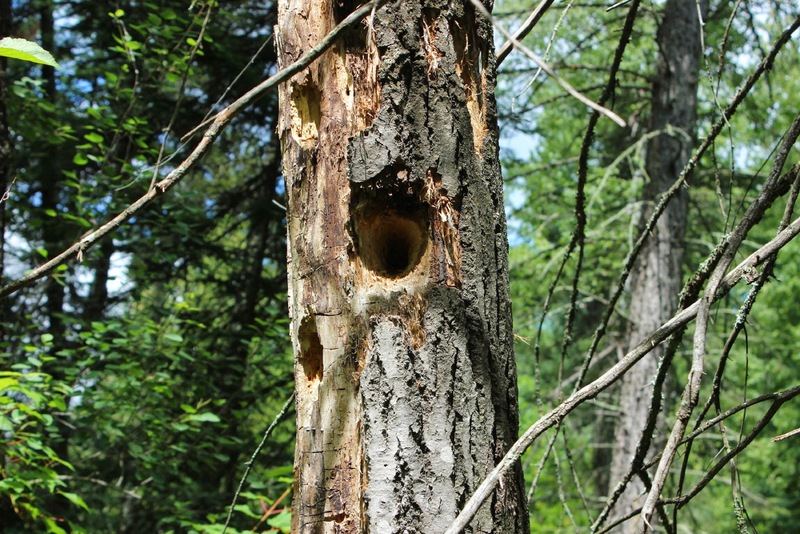 But when possible they are left to help with the cycle of the woods--hosting insects and feeding the woodpeckers and other birds before they fall and create that natural mulch. 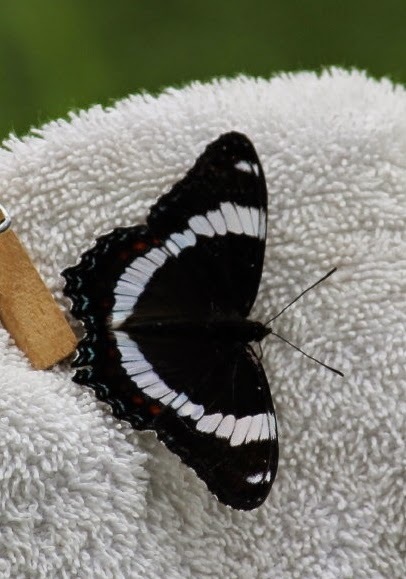 Even the butterflies are happy. Minnesota does have lakes everywhere you turn. There are some wonderful lakeside properties you can see right from the roads. And we are sure there must be many more hidden on back roads near small and larger lakes. 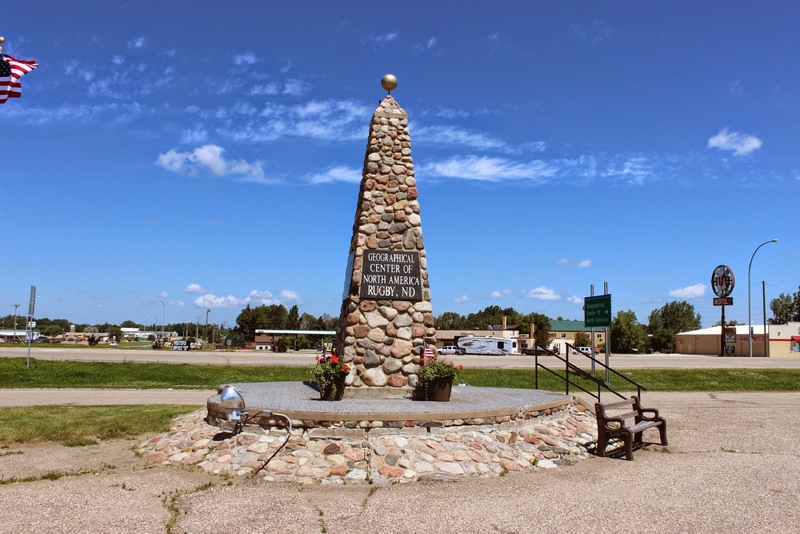 Our next stop is on a Corps of Engineering campground near McGregor, Minnesota. 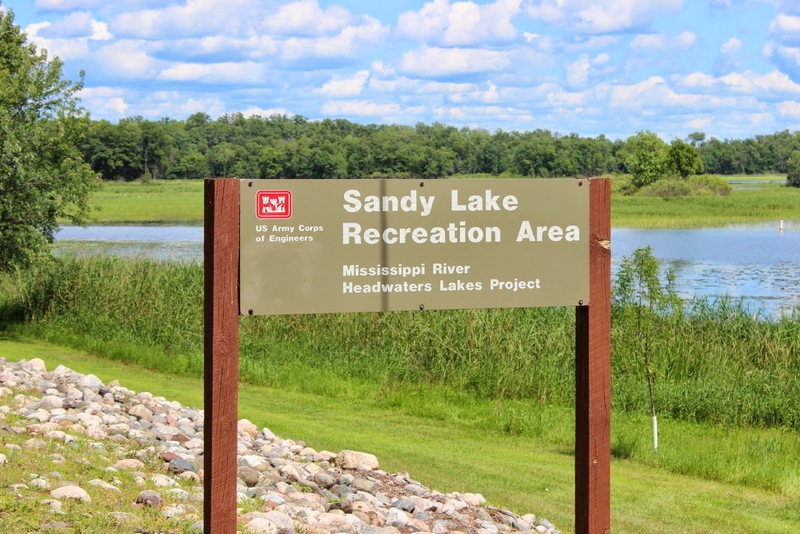 It is part of the Corps Mississippi Headwaters Lakes Project. This lake would be used in the 1800's by the fur trappers to access the Mississippi River, just a mile or so away. The sites, as usual at the Corps, are well spaced and well cared for. 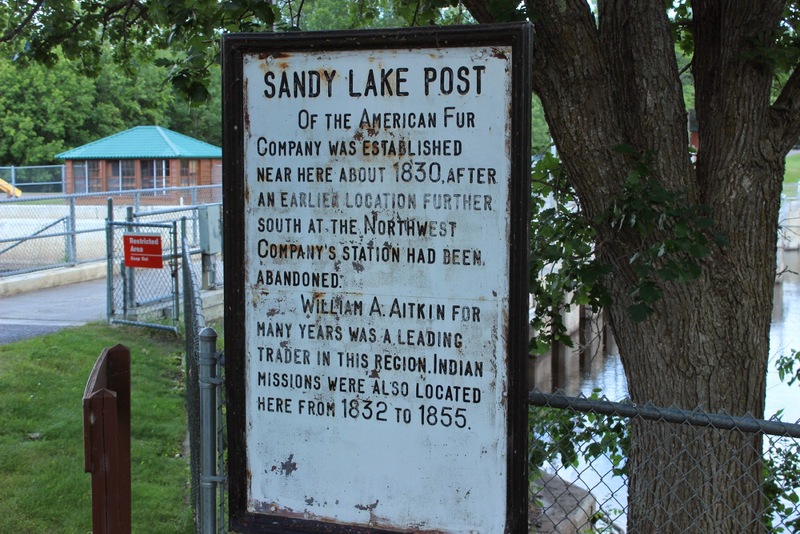 Sandy Lake Post was near here for the American Fur Company. This is still near the Mississippi Headwaters which we saw last year at Lake Itasca State Park. By the way, that state park is over 32,000 acres and includes more than 100 lakes( of the 10,000). Jan is checking the boat launch area. As out-of-staters, we notice that every town here has a very prominent(or in many cases, more than one)bait shop and/or outdoor shop. Minnesotans love their fishing. Some of you will enjoy checking out this link to the Minnesota Fishing Guide Service to see what fish are in the lakes. At this point , we are south of Route 2 and take Route 210 out of McGregor to Route 35 north to Duluth and into Wisconsin. If you go this way, be sure to look for the rest area at the top of 35 before you cross the river. You can see Lake Superior in the far distance, and the St. Louis River to the right. Across the water is Wisconsin. If you follow us at all, you know that Jan and I like state parks, Corps of Engineer parks, national parks, and also national forest campgrounds. 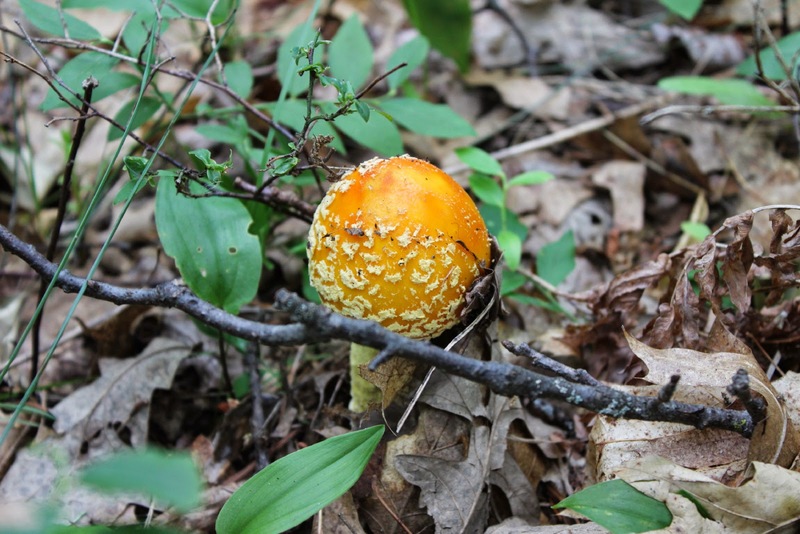 Wisconsin has a number of forest campgrounds. We usually search the reviews online and also the Dow site http://www.forestcamping.com/dow/list/nflist.htm to see if it will actually work for us. Some campgrounds are too far for us down dirt roads and some are limited to tents or vehicles less than 20 foot length( which usually means rough roads and tree branches). This one was great. 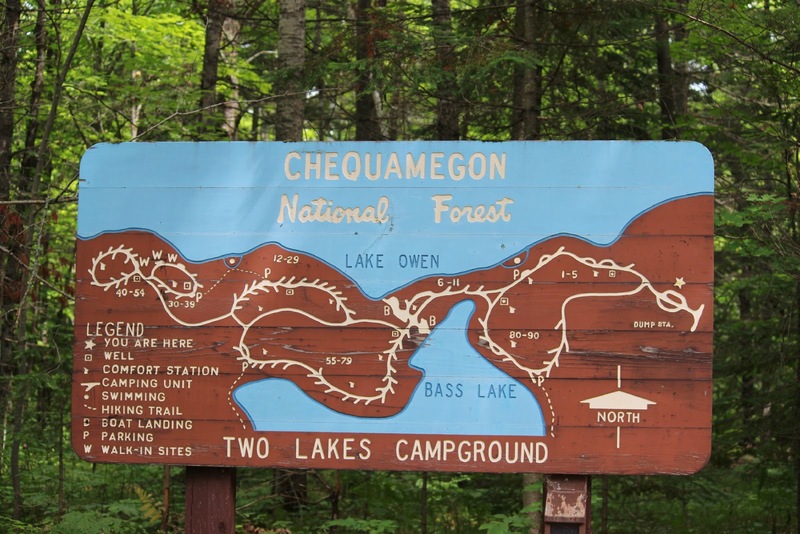 Two Lakes Campground in the Chequamagon National Forest. 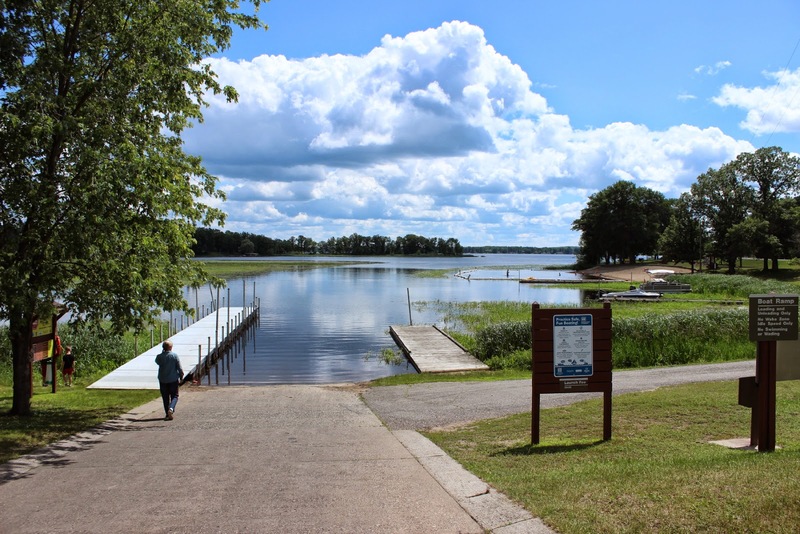 It is listed in Drummond, Wisconsin and is on( you guessed it) two lakes , Bass Lake and Owen Lake. 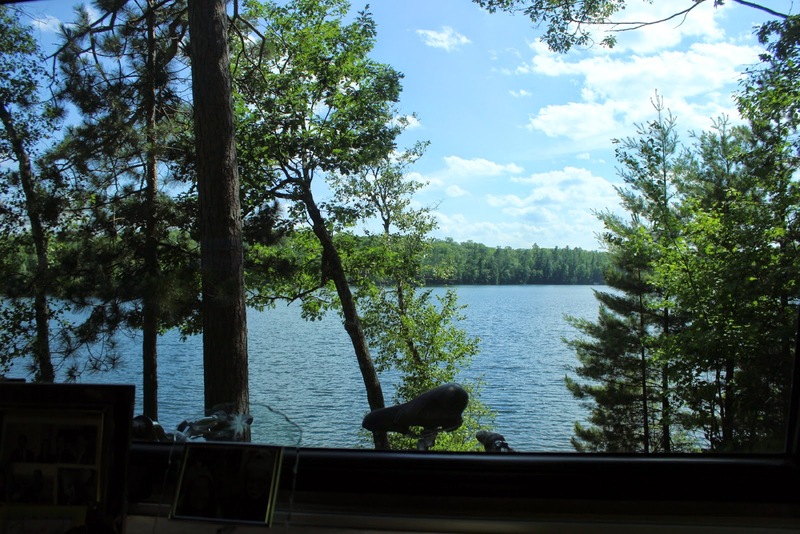 This is the view from our Site # 83 on Bass Lake. Our site is right above the "K" in Bass Lake. 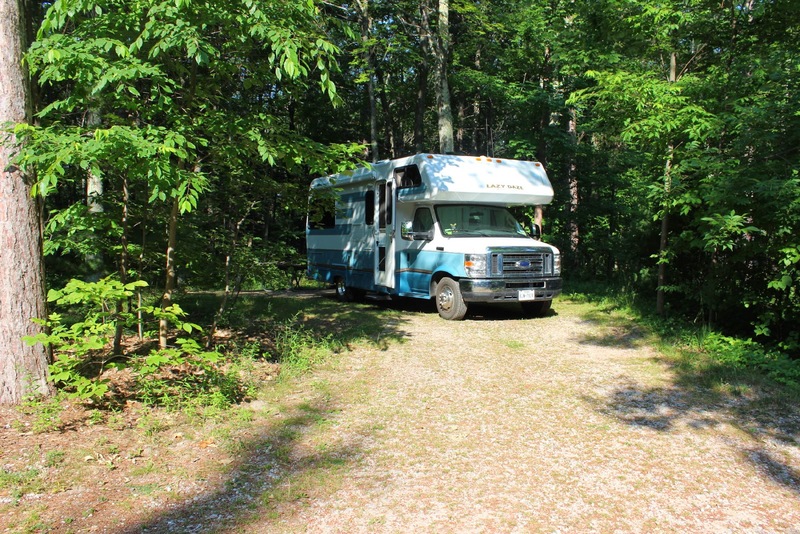 The campground is busy on the weekend, but even then, there are many sites unoccupied. Perhaps because it is remote. The campground was about 25 miles south of Route 2 on Route 63. Then it was about 5 miles in on a well paved road. 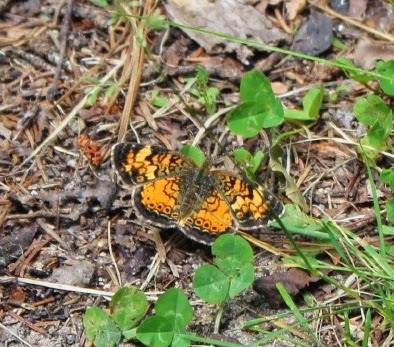 We had a chance to see butterflies, otter,loons,Ruffed Grouse, and, of course, mosquitoes. Many to most of the campers here had also brought boats, canoes, and kayaks. 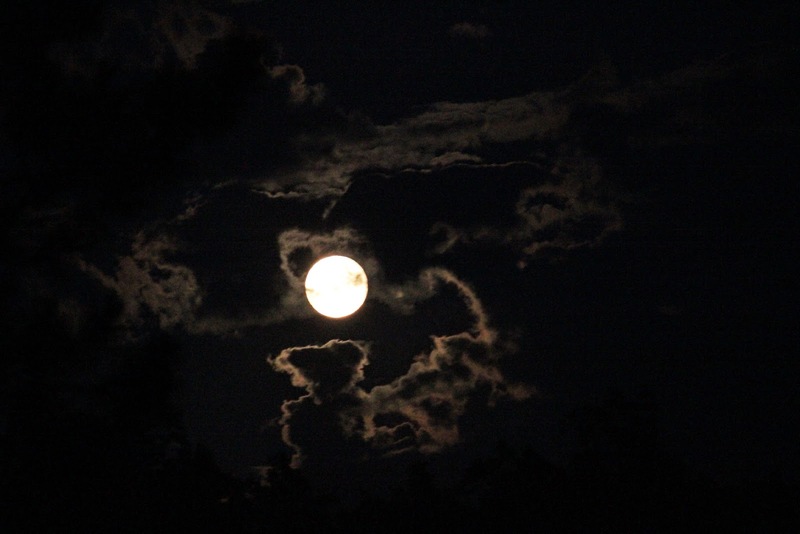 Jan and I are lucky that our last night at Two Lakes is also the full moon. A beautiful view right from our campsite.